Peripheral blood mononucleated cells consist of haematopoietic stem cells (HSCs) and mesenchymal stem cells (MSCs). To date there is no well-defined isolation or characterisation protocol of stem cells from human adult peripheral blood mononucleated cells. Our aim in this study was to isolate and characterise mononucleated cells from human peripheral blood. Peripheral blood mononucleated cells were isolated using the Ficoll-Paque density gradient separation method and cultured in complete medium. After 4 days of culture, adherent and suspension mononucleated cells were separated and cultured for 14 days in an in-vitro culture selection. Stem cells in the isolated mononucleated cells were characterised using a multidisciplinary approach which was based on the expression of stem cell markers, morphology and the capacity to self-renew or proliferate and differentiate into specialised cells. 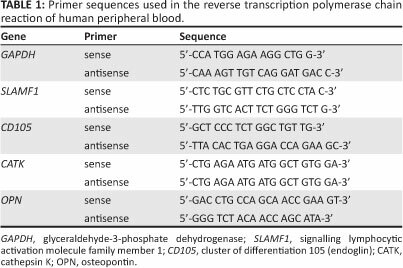 Reverse transcription polymerase chain reaction was used to identify the expression of an HSC marker (signalling lymphocytic activation molecule family member 1, SLAMF1) and a MSC marker (CD105). Results revealed that adherent mononucleated cells were positive for MSC markers, whereas mononucleated cells in suspension were positive for HSC markers. The isolated adherent and suspension mononucleated cells were able to maintain their stem cell properties during in-vitro culture by retaining their capacity to proliferate and differentiate into osteoclast and osteoblast cells, respectively, when exposed to the appropriate induction medium. The isolated mononucleated cells consisted of suspension HSCs and adherent MSCs, both of which have the capability to proliferate and differentiate into mature cells. We have shown that suspension HSCs and adherent MSCs can be obtained from an in-vitro culture of peripheral blood mononucleated cells. Our main objectives for this study were the isolation, culture and molecular characterisation of mononucleated cells from human peripheral blood. Stem cells in the isolated mononucleated cells were characterised using a multidisciplinary approach which was based on the expression of stem cell markers, morphology and the capacity to self-renew or proliferate and differentiate into specialised cells as evidenced by proliferation and molecular analysis. Mononucleated cells consisting of MSCs, HSCs and their progenitors, along with monocytes, lymphocytes and macrophages were isolated from the buffy coat of blood. Our results demonstrated that suspension and adherent mononucleated cells showed molecular expressions of HSC markers and MSC markers, respectively. Furthermore, suspension and adherent mononucleated cells were still able to maintain their stem cell properties during in-vitro culture. Mononucleated cells were isolated from healthy donors aged between 18 and 25 years old by density gradient centrifugation using Ficoll-PaqueTM PLUS (GE Healthcare, Uppsala, Sweden). Human peripheral blood samples were obtained after consent from the donors and approval from the ethical committee of the Faculty of Science and Technology, National University of Malaysia. The blood samples were diluted three times with Hanks' Balanced Salt Solution (Sigma, St Louis, MO, USA). The diluted blood samples were carefully layered 1:1.5 on Ficoll-PaqueTM PLUS and centrifuged at 400 g for 20 min at room temperature. The mononucleated cell layer at the plasma-Ficoll interface was washed three times with phosphate buffered saline and cultured in six-well plates with complete medium containing alpha medium essential medium, 2% (v/v) penicillin-streptomycin and 10% (v/v) newborn calf serum at 37 °C in a humidified atmosphere containing 5% CO2 for 4 days. After 4 days, non-adherent (suspension) mononucleated cells were transferred into new plates. 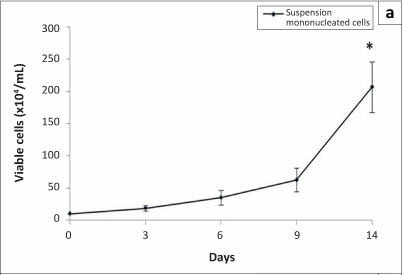 Both adherent and suspension mononucleated cells were maintained in the complete medium with twice weekly medium exchange for 14 days in in-vitro culture before further use. May-Grunwald Giemsa staining was carried out with May-Grunwald's eosin methylene blue solution (Merck, Darmstadt, Germany) and Giemsa solution (Sigma, St Louis, MO, USA). May-Grunwald Giemsa staining started with slides immersed in 100% (v/v) May-Grunwald for 2.5 min. The slides were then transferred directly to 4% (v/v) Giemsa for 2.5 min and briefly rinsed with distilled water. Excess dye was wiped off and the slides were air-dried. The May-Grunwald Giemsa stained areas were viewed by light microscopy. Suspension and adherent mononucleated cells were cultured in complete medium. For suspension mononucleated cells, the trypan blue exclusion assay was used to observe the proliferation of the cells, whereas the 3-[4,5-dimethylthiazol-2-y]-2,5-diphenyltetrazolium bromide (MTT) assay was used to observe the proliferation of adherent mononucleated cells. Data were statistically analysed using paired t-tests. Effects were considered statistically significant at p < 0.05. The ability of adherent and suspension mononucleated cells to differentiate into specialised cells from their lineages was evaluated by differentiating the suspension and adherent mononucleated cells into osteoclast and osteoblast cells, respectively. Cells cultured in complete medium were supplemented with 50 ng/mL recombinant soluble receptor activator of nuclear factor kappa-B ligand (sRANKL) and 25 ng/mL macrophage colony-stimulating factor (M-CSF) to induce osteoclast differentiation, while 50 ìg/mL ascorbic acid and 10 mM â-glycerophosphate were added to induce differentiation into osteoblasts. The cultures were maintained at 37 °C in a fully humidified atmosphere containing 5% CO2. Some of the cells were cultured with complete medium without supplementation of growth factors to act as controls. Total RNA was extracted using TRI ReagentTM (Sigma, St Louis, MO, USA) following the manufacturer's instructions. Total RNA was extracted from adherent and suspension mononucleated cells that had been cultured in complete medium and differentiation medium. Total RNA (1 ìg) was subjected to reverse transcription polymerase chain reaction (RT-PCR) amplification using an Access RT-PCR System kit provided by Promega (Madison, WI, USA). First-strand complementary DNA (cDNA) was synthesised by reverse transcription at 45 °C for 45 min, followed by avian myeloblastosis virus reverse transcriptase inactivation at 94 °C for 2 min. Second-strand cDNA synthesis and PCR amplification consisted of 40 cycles of denaturation at 94 °C for 30 s, primer annealing at 55 °C (GAPDH), 54 °C (SLAMF1) or 61 °C (CD105) for 1 min and extension at 68 °C for 2 min, with a final cycle at 68 °C for 7 min. The specific primer sequences used are shown in Table 1. GAPDH was used as a positive control. RT-PCR amplifications were performed in a Mastercycler Gradient thermocycler (Eppendorf, Hamburg, Germany). The PCR products were separated by 1% (w/v) agarose gel electrophoresis. The separated DNA fragments were visualised by ethidium bromide staining and photographed using the Alpha Imaging System (Alpha Innotech, San Leandro, CA, USA) under UV light. Mononucleated cells consisted of MSCs, HSCs and their progenitors, along with leukocytes and macrophages. Mononucleated cells were isolated from the buffy coat of peripheral blood using a density gradient centrifugation on Ficoll-Paque where differences in density separate mononucleated cells from other blood cells. However, isolated mononucleated cells are a heterogeneous population. In this study, we further separated the mononucleated cells according to their physical characteristics. Non-adherent (suspension) and adherent cells were cultured separately after 4 days of isolation. 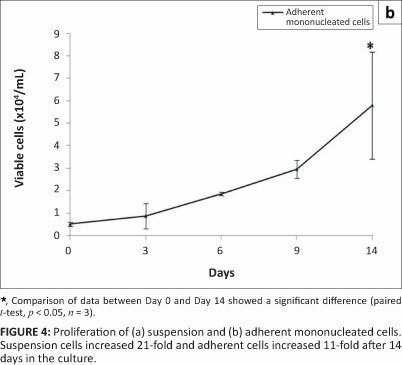 Both adherent and suspension mononucleated cells were maintained in the complete medium for 14 days of culture for the purpose of separating adherent and suspension cells and also to deplete most of the unwanted cells (e.g. differentiated and precursor cells) that have a short lifespan, for example, granulocytes (30 min -40 min in peripheral blood with a total lifespan of 7-13 days depending on pathological state) and monocytes (5-7 days).9 Figure 1 shows the morphology of suspension and adherent mononucleated cells after 14 days of culture. Suspension cells without staining appear morphologically rounded (Figure 1a). The morphology of the suspension cells after staining included a large single nucleus that occupied much of the cytoplasmic space, resembling that of lymphocytes. MSCs are cells that adhere to the tissue culture plastic and display a fibroblastic appearance10; adherent mononucleated cells showing spindle-shaped fibroblast-like morphology can be seen in Figure 1b. After May-Grunwald Giemsa staining was carried out on the suspension cells fraction, the nuclei were stained dark purple and the cytoplasms were stained a lighter purple (Figure 1c). Physical characteristics alone are not sufficient to prove that HSCs and MSCs are present in mononucleated cells. The existence of HSC and MSC mononucleated cells was further characterised by a molecular approach (RT-PCR analysis) using specific HSC and MSC markers. Glyceraldehyde-3-phosphate dehydrogenase (GAPDH) is one of the most commonly used housekeeping genes used in comparisons of gene expression data as it is constitutively expressed at the same level in mammalian cells and tissues.11 Therefore in this study, GAPDH was used as a positive control for RT-PCR analysis. 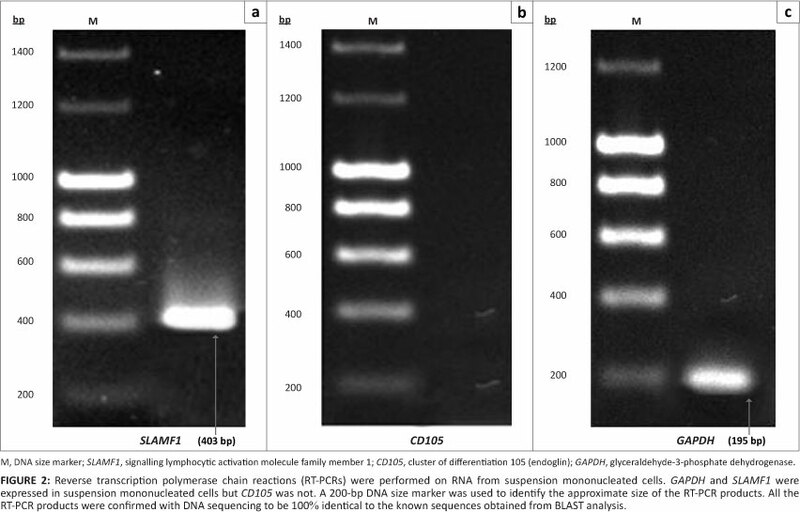 As shown in Figure 2, the suspension mononucleated cells were positive for the presence of an HSC marker (signalling lymphocytic activation molecule family member 1, SLAMF1) as well as GAPDH with RT-PCR products of the expected size for SLAMF1 (403 bp) and GAPDH (195 bp). 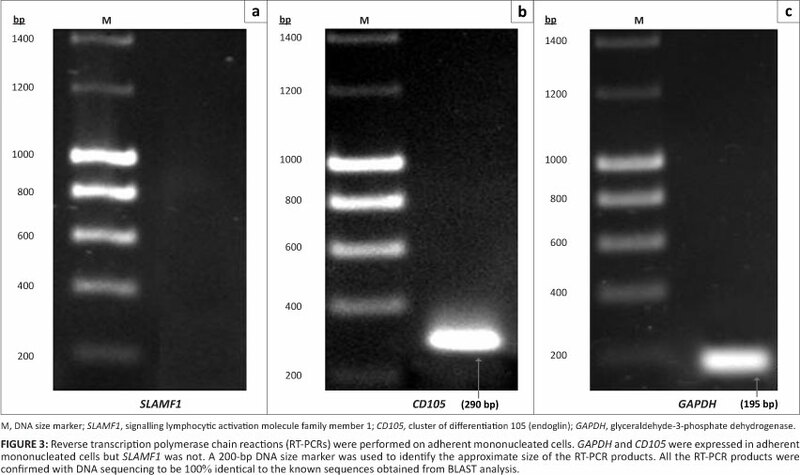 Figure 3 shows amplification of the RT-PCR products of GAPDH and a MSC marker (CD105) in RNA from adherent mononucleated cells. SLAMF1 and CD105 were not expressed in adherent and suspension mononucleated cells, respectively. Stem cells possess two properties: the ability to self-renew or proliferate and the ability to differentiate into specialised cells. In this study, the proliferation of suspension and adherent mononucleated cells in an in-vitro culture was investigated using the trypan blue exclusion assay and the MTT assay, respectively. Figure 4 shows the proliferation of suspension and adherent mononucleated cells. Statistical analyses comparing data from Day 0 and Day 14 showed a significant increase (p < 0.05) in viable cell numbers in both cell populations. From Figure 4a, a significant increase of an average of 21-fold in viable cells was observed on Day 14 compared to Day 0. The number of adherent cells also increased significantly by an average of 11-fold (Figure 4b). These results show that suspension and adherent mononucleated cells were able to proliferate during in-vitro culture conditions. The differentiation of stem cells into specialised cell types is one of the important properties of stem cells. In order to examine the ability of MSCs from adherent mononucleated cells and HSCs from suspension mononucleated cells to differentiate into specialised cells from their lineages, suspension and adherent mononucleated cells were differentiated toward osteoclast and osteoblast cells, respectively, by adding specific differentiation factors to the medium. sRANKL and M-CSF were added to induce differentiation into osteoclasts while ascorbic acid and -glycerophosphate were added to induce differentiation into osteoblasts. Molecular analysis was performed to determine in-vitro differentiation of suspension and adherent mononucleated cells into mature osteoclast and osteoblast cells, respectively (Figure 5). Our results indicate that there is a population of stem cells in the peripheral blood mononucleated cell fraction. The isolated mononucleated cells consist of HSC (suspension) and MSC (adherent) components. Moreover, the isolated stem cells amongst adherent and suspension mononucleated cells are still able to maintain their stem cell properties during in-vitro culture by retaining their capacity to self-renew or proliferate and differentiate into specialised cells. This study was supported by grants from the Ministry of Higher Education, Malaysia (FRGS/1/2011/SG/ UKM/02/13 and UKM-DD-03-FRGS0030-2010), the Ministry of Science, Technology and Innovation (MOSTI), Malaysia (09-05-MGI-GMB002), the Department of Fishery Malaysia (STGL-007-2010/9) and the National University of Malaysia (UKM-OUP-KPB-33-170/2011 and UKM-GUP-2011-093). R.A.K. conducted the laboratory work, generated and analysed the data, and wrote the manuscript. R.M.A.W. and S.S. assisted in the analysis of the data. S.H.Z.A. designed the study, analysed the data and contributed to the writing of the manuscript.